Whatever the occasion, the Bluetrek M2 offers interchangeable covering plates in a range of colours, so you can change the colour of your Bluetooth headset to suit your look. Included in the box are fiery red, champagne chrome, royal blue, and black chrome interchangeable covers that easily clip-on and clip-off the headset. Dedicated sound in the speaker for low battery, switch on, switch off, pairing, volume adjustment, voice activation, reconnection request, waiting call, etc. Stand-by up to 11 days. Weight about 12 grams (excluding ear hook). Size: 51 mm (L) x 21 mm (W). Operation range: Up to 10 metres. 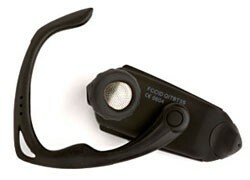 Removable & adjustable ear hook which allows the headset to be worn on either ear comfortably. Comfortable even when wearing glasses. Compatible with Bluetooth enabled devices such as mobile phones, PDAs & computers that support Headset and / or Hands-free profile.